Over the past 2 1/2 years or so there have been two "B-movie" installations to hit theaters, the first was Piranha 3D and most recently Shark Night 3D. The former turned out to be an enjoyable, mercilessly gory romp, retaining ideal exploitation instincts and a marvelous sense of humor. The latest fish-based horror offering is "Shark Night 3D," which is about as polar opposite a viewing experience from "Piranha 3D" as possible. Labored, idiotic, and tightly restricted when it comes to violence, the feature is a fiasco on every level of execution, aiming to be some kind of camp classic yet laden with terrible direction that renders the whole thing ridiculous. Ready to celebrate the weekend at Sara's (Sara Paxton) extravagant Louisiana bayou vacation home, college students Nick (Dustin Mulligan), Malik (Sinqua Walls), Beth (Katharine McPhee), and Gordon (Joel David Moore) gear up and head out to the remote island. Before anyone has a chance to settle in, a shark attack takes Malik's arm while he wakeboards, initiating widespread panic, leaving the gang frantic to contact medical help. To the rescue are shady characters Dennis (Chris Carmack) and Red (Joshua Leonard), two men prowling the waters, hoping to start trouble. As the night of panic wears on, the group encounters various sharks swimming free in the saltwater lake, carrying out a devious plan hatched by some sick individuals nursing a serious fish fetish. "Shark Night 3D" is directed by David R. Ellis, the filmmaker behind such duds as "Snakes on a Plane" and "The Final Destination." The screenplay by Will Hayes and Jesse Studenberg is rooted in camp, laying on implausible scenario after another slowly over the picture's 80-minute run time. The writers appear to have a reckless direction with the material, yet Ellis is unwilling to follow, taking some of this subject matter seriously, mixing flying shark attacks and on-the-nose foreshadowing (Red's chompers have been filed down into shark teeth) with teary confessional sequences, striving to develop these characters beyond the one-dimensional bait they are. The helmer doesn't seem to get the joke, which makes "Shark Night 3D" intolerable at times, wasting precious minutes on the inner turmoil of these tedious, goofy individuals instead of staging more robust man vs. shark encounters. Now arriving on Blu-ray, Shark Night is presented in high definition widescreen. Originally shot in 3D (the film's original title was Shark Night 3D, dropped for the home release), the transfer here is good, but not great, with bright colors all around. There are moments where the image looks somewhat murky, especially during some of the underwater sequences. This could be due in part to it being filmed in a lake, so the clarity is not going to be ocean-quality. The audio is presented in decent enough, though the heavy bass (especially in the beginning of the film) can be a bit overpowering. For those of you who own surround sound speakers, the producer's utilize this technology well. Also included are English and Spanish subtitles, but no alternate language tracks. The bonus features are rather slim. Fans get four short featurettes—"Ellis Island," "Shark Attack! Kill Machine!" 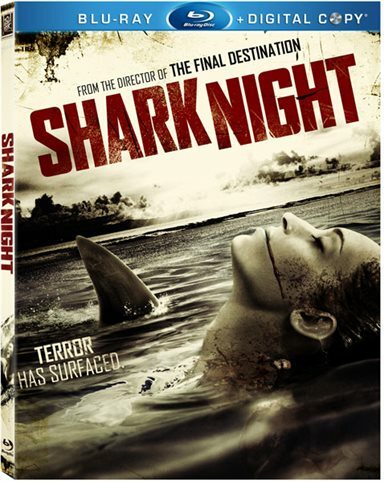 ""Shark Night's Survival Guide," and "Fake Sharks, Real Scares"—which deal with trivia about sharks, the effects work, and some of the kills featured in the movie; plus a theatrical trailer and a digital copy of the film (on a separate disc). Populated with some truly bad actors (e.g. Moore, Paxton, Carmack, and Donal Logue, here as an inept sheriff) and imbecilic plot developments, "Shark Night 3D" is a leaden effort, refusing to shed its seriousness and explode as a violent free-for-all, teeming with spastic hunting sequences and preposterous shark-fu. What's actually here is quite unimaginative, artificial (the shark CGI is iffy at best), and in the end, disappointing. Download Shark Night 3D from the iTunes Store in Digial HD. For more information about Shark Night 3D visit the FlickDirect Movie Database.